It is commonly acknowledged that one of the characteristics of good classroom instruction is that language teaching should include systematic and explicit instruction and that student learning should be supported by feedback (Unruh & McKellar, 2017). Feedback can be provided in various forms such as written and oral and in different ways such as direct or indirect, and positive or negative. However, as underscored by Cheng and Fox (2017), how learners use the feedback provided by their teachers is what really counts. Teachers need to ensure that the feedback provided contributes to student learning and that learners know what they are going to do with the feedback given. As Sadler (1998) has argued, “It cannot simply be assumed that when students are ‘given feedback’ they will know what to do with it” (p. 78). 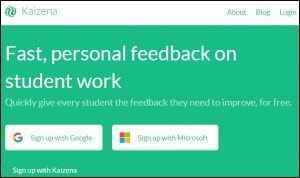 Kaizena, available at https://kaizena.com, is a web-based platform enabling teachers to provide voice feedback on student work. In addition to textual commentary, the main advantage of using this website is that it is fully integrated with Google Drive, and it allows recording voice messages on the student work without installing any software. 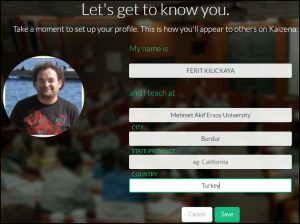 Then, you can set up your profile, providing information such as your name institutional affiliation. After your profile is set up, a dashboard screen will appear where you can “create new group”, “join group,” and join “sample group”. Starting with “sample group” is a good option since you can see example feedback and student work and learn the features of the website through trial and error before you use the website with your students. 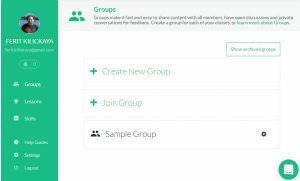 When you click on “create new group,” you can select predetermined categories or provide a new group (or a class, if you like) by clicking on “Something Else.” After providing the group (class) name and the level, you can ask your students to join the group by sharing the group’s designated code. 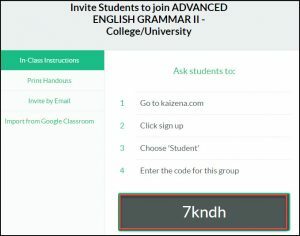 Students can be invited through emails or you can share the instructions with handouts automatically created by Kaizena. After students login in to Kaizena, they can upload their work/assignments. Student work and teacher feedback will appear in a conversation-style format, which helps both parties keep a record of responses and feedback. When you click on student work, Kaizena will open a new page where you can provide your comment in the left column and you can see the student work in the right column. There are four types of feedback you can leave for your students: Voice comments, Text comments, Lessons, and Skills. You can leave voice comments through clicking on the “microphone” icon; recordings can be up to three minutes long. Adding textual comments can be done by either typing in the comment box or clicking on the “A” icon. 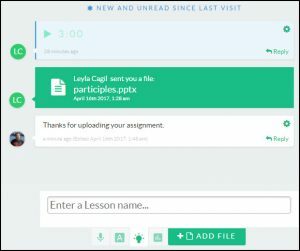 If you give your students the same feedback, you can create “Lessons” that will reuse feedback supported by links, texts, or voice comments. You can click on the “lightbulb” icon and create/add your own lessons. If you use specific rubrics, standards, or objectives and would like to let your students know how they are rated, you can click on the “graph” icon and create skills. Any comments left can be edited or deleted using the ‘Gear’ icon next to it. You can also highlight the specific parts of student work in different colors. In order to do that, you can select and highlight any text in the student work and provide your feedback. It is also possible to add a file such as Google Documents and PDFs to any conversation to enhance the feedback given. You can do this by clicking on “Add File” button. A final note: These conversations are private; that is, only the selected student and you can see the comments provided. However, if you would like everyone to see an announcement and/or a general comment, you can use “Broadcast” or “Everyone in Title of Your Group” to send a message to each conversation between you and the members of your group (class). 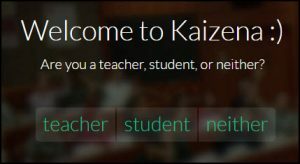 Kaizen is a cost-effective website for teachers willing to go beyond the usual textual comments while providing constructive feedback for their students’ work. 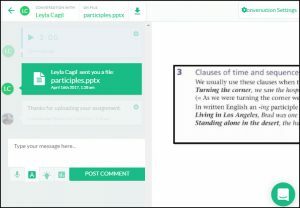 Comments enable both teachers and students to see the comments and attached files in a linear, conversational order, which makes it easy to follow the suggested changes. This format also keeps a record of the discussions between the student and the teacher. Compared to textual comments, audio feedback can also encourage students to practice speaking and listening skills, which makes Kaizen a great tool for both partners. Therefore, Kaizen proves to be a handy tool for teachers to provide their students with voice feedback, which I believe might increase student achievement and interest. Moreover, Kaizen can be integrated with Google Documents, and it is possible to use Kaizen on iOS devices. I hope that Kaizen will also be compatible with Android devices in the future. Cheng, L., & Fox, J. (2017). Assessment in the language classroom: Teachers supporting student learning. London: Palgrave. Unruh, S., & McKellar, N. A. (2017). Assessment and intervention for English language learners: Translating research into practice. Cham, Switzerland: Springer.